i love my church. seriously. i do. tonight, in sunday school (or saturday night school for us) :-) emma was given a 5$ bill to take home and the only instructions were to “give it away”. the kids were told to think and pray about it... and, choose someone or something to give it to. so, all week emma has been thinking about how she wanted to give her money away. all week she has agonized over this. 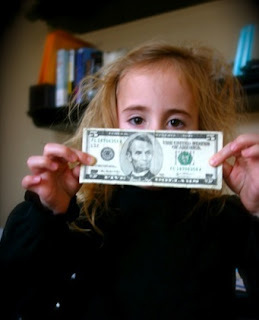 $5 is a big deal for such a little girl. especially now, in the season of “gifts” and “wants”... what a “gift” she (and we as a family) were given by our church.